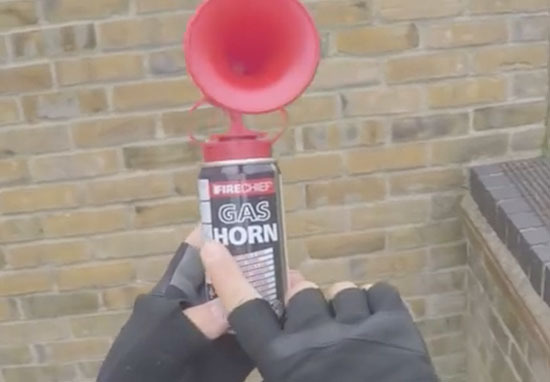 Sometimes pedestrians wander from designated pavements into the bike lane, and one cyclist was so fed up of having to slow down while they moved that he came up with an alternative solution: an air horn. In a hierarchy of road occupants, car drivers sigh at cyclists, and cyclists sigh at stray pedestrians. Unlike this cyclist however, most of them just accept that they have to share the road. After showing viewers a glimpse of his everyday walker-filled struggles, the frustrated cyclist captured the responses unsuspecting members of the public gave when he put his new attention seeking airhorn to use. Admittedly, the air horn did seem to have a lot more authority than an innocent, twinkling bell. The pedestrians seemed much more willing to move when it sounded like a huge truck was coming up rapidly behind them. I am fed up with people walking in the Cycle lane in London. It’s like they don’t even care that is there. I decided to make my presence more known by investing in an air horn. These are my results. Despite its success at getting pedestrians to move, the use of the air horn did have its issues. One surprised man nearly leapt into the main road in fright, while another, more aggressive member of the public actually pushed the cyclist off his bike after a short dose of the gas powered notification system. Though, those issues probably wouldn’t have occurred if the pedestrians hadn’t been in the bike line in the first place. 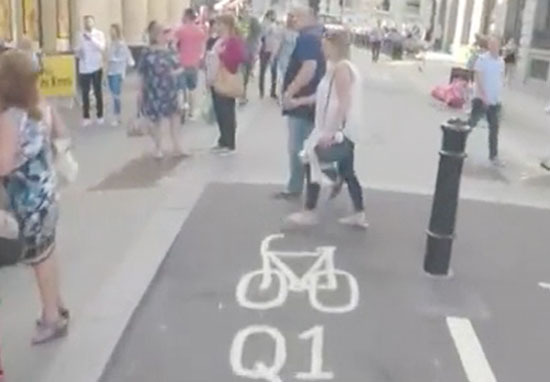 The video received mixed opinions from viewers, with some sticking up for the pedestrians who, at some points in the video, didn’t have much choice but to be in the cyclist’s way. You’re honking at them for crossing a street that REQUIRES them to walk through the bike lane? Cmon dude. i get if they are just walking in the lane, but when they’re just crossing the street? I’m sure there is a lot of scope for more videos like this, given the host of rivalries that seem to exit between various modes of transport. If you drive in the bike lane, just know, you’re tacky and I hate you. Why do people think it’s okay to walk in the middle of the road ? I know how dangerous riding with cars can be. I’ve ridden the scooter too. They’re fun and convenient, and crazy dangerous if you’re not in a bike lane or wearing a helmet. As a bike commuter, I know how dangerous riding with cars can be. I've ridden the scooter too. They're fun and convenient, and crazy dangerous if you're not in a bike lane or wearing a helmet. Why do people think it's okay to walk in the middle of the road ? 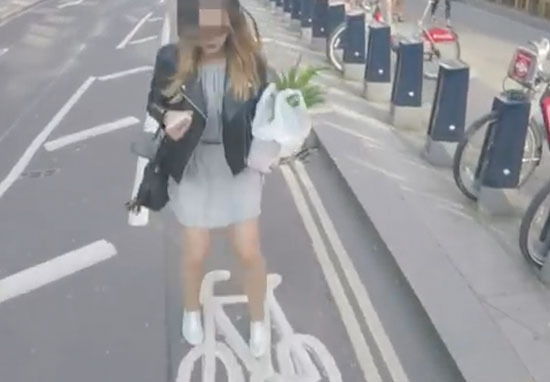 As annoying as it must be for cyclists to have people meandering in their lane, at least the situation has produced this entertainingly questionable video showing one alternative method of getting people’s attention.